David, Lachlan, & I took my Subaru out to the beach yesterday afternoon. I don't ever actually drive it on the beach (I like to keep it away from salt water), but I had just had Matt Tolson spray the underside with burnt motor oil and linseed oil (this is many islanders' preferred method of undercoating). I didn't actually drive it on the beach, just down the path, through the soft sand, at ramp 67 -- enough to coat the oil with a layer of sand so it forms a crust. But we did walk out to the ocean of course. While we were there three commercial fishermen came by and launched their dory into the surf. A dory is a fishing boat with a narrow, flat bottom, high bow, and high, flared sides. They pushed the dory into the waves and two of them jumped in and lowered the motor. After starting the motor they crashed through the surf and started paying out their net (one end was securely anchored up on the beach). Once beyond the breakers they turned north and circled around. After little more than five minutes they had surfed the boat back onto the beach and almost immediately began hauling the net back. They netted quite a few fish -- mullet, channel bass, speckled trout, among others -- as well as a couple of skates and even a puffer fish. They had been careful to avoid the several pods of dolphin that we'd seen just beyond the outer breakers. Lachlan enjoyed the show, and especially touching the many fish brought into shore. Who knows, maybe he'll decide to be a commercial fisherman some day. I didn't have a camera with me, and have been unable to find a photo of an Outer Banks dory on the web, but I did find a picture of a similar, New England dory. Click here to see the photo. To see new items we've added to our on-line catalog, please click here: "What's New at Village Craftsmen". You can read our latest newsletter here. It's the story of the Community Store and other general stores on the island. Last night a warm wind was rustling the hundred-year-old oaks in the graveyards, a few scattered clouds scudded across the bright half moon, and dark shadows danced on marble tombstones. It was the perfect night for a ghost walk. Danielle from Raleigh and a handful of her family and friends joined me for a special Sunday night tour. They listened intently to tales of the walking dead, of strange footsteps in empty bedrooms, of dozens of drowned seamen buried in unmarked graves on the beach, of phantom freighters, and wandering ghosts of long-dead sailors and mad old women. It was the perfect night for a ghost walk. I believe they stayed close together as they made their way down the sandy lane back to their car. Friday night from 7:00 - 8:30 several dozen islanders put together our annual Howard Street Spook Walk, a benefit for our school. This year's event highlighted a number of traditional Ocracoke ghost and creepy stories. The island's most famous former resident was there, of course. And without his head! So, too, were the survivors of the wreck of the steamboat "Home" (that was in 1837), and the woman who turned over in her casket (and scratched out the lining, and pulled out her hair). Don't think about that when you go to bed tonight! Several folks reenacted the scene of Ocracoke's first murder (also in 1837), and the death of Mrs. Godfrey (whose ghost is reported to still wander the upper floors of the Island Inn). Fannie Pearl was there in her white coffin, as were other assorted ghosts, goblins, and scary clowns. Fortunately the rain held off until the very last few minutes of the Spook Walk. The forecast had been calling for rain and wind gusts of over 50 mph. When I awoke Saturday morning there were puddles everywhere and there was a mild breeze. If the wind was strong and blustery during the night I knew nothing of it. I slept soundly and blissfully in spite of all the specters and ghouls. A couple of days ago one of our readers, Wesley Furr, sent me several photos he took on a recent trip to Ocracoke. He graciously agreed to let me add them to our daily journal. If you are an off-island reader of our journal I hope these pictures bring back good memories. This first photo is looking down Howard Street from the end nearest NC Highway 12. This one is taken on Lawton Lane, near Howard Street, looking towards NC Highway 12. Autumn does not grace this island with color. No yellow ochres, or scarlets, or rusty oranges. Just the greens (forest green, blue green, and yellow-green of live oaks, cedars, and yaupons) year 'round. However, we don't have the stark grey barren limbs of winter either. But the days are growing shorter; the air is cooler; and the streets are quieter. Fall has definitely arrived on the Outer Banks. And one historical note: On this day in 1859 the schooner "Mary" wrecked on Ocracoke's beach. The press of summer business, family responsibilities, & off-island trips with Lou Ann have left me with a number of revisions to our web site and new items to add to our on-line catalog. In the last several days I have uploaded quite a few new items (framed mini-prints, doorbell surrounds, several kinds of pottery, kitchen items, and jewelry boxes). We will be adding even more new merchandise in the coming weeks. Be sure to check out our "What's New Page"regularly as the holiday season approaches. As you know, we carry all American-made hand-crafts of the finest quality. We ship year-round and keep most items in stock ready for Christmas, birthdays, weddings, and other special occasions. Several of our long-time readers have rented my mother & father's former home ("Lawton's") on Howard Street the last few summers. Some just learned that this cottage will no longer be a summer rental. One person commented, "I just found out that you will not be renting Lawton's next year. What a shame. It is truly a home away from home." I really appreciate the positive comments, and am happy so many people enjoyed staying there. We always liked having pleasant and interesting neighbors throughout the summer. I hope it is some consolation to our former renters to know that my daughter and her family will be moving into the house at the end of this year. Soon Amy, David, & Lachlan will be my next door neighbors; and the house will once again echo with the laughter of Lawton & Connie's grandchildren and great-grandchildren. Many thanks to all of our loyal renters. But the sky is clear and blue, and sunlight rests gently on fences and yaupons this morning. It was time for a change of season. It is still warm here -- in the upper 60s -- though a light rain has begun to fall. Hardly anyone is milling about. Amy, Lachlan, and I spent some time at the beach earlier. Mostly just a few fishermen out there....and a couple of folks sitting and reading. We didn't go in the water. It was a bit rougher today than the last several days. But we sat up by the dunes and played and talked for almost two hours. After lunch I finished a few household chores....and then made deviled eggs. This evening I'll be going to an "October Birthday Party." It will be a potluck dinner, and I know folks will be looking for the deviled eggs. Fowler will be there along with six or eight others who have birthdays in October. If your birthday is in October, we all wish you a "Happy Birthday!" also. Lachlan & I went visiting yesterday afternoon. We stopped to see Ann Scarborough. She is 97 years old and a delight to spend time with. I can only hope I am as mentally sharp if I am lucky enough to live so long. Ann's great-grandson, Max, was off-island so we didn't get to visit with him. But Lachlan did manage to find most of his toys. Then we stopped by to see Fowler and Chloe O'Neal. Fowler will be 85 years old today. Fowler was one of my dad's closest buddies. And Chloe & Fowler's granddaughter, Aurora Dawn, is the same age as Lachlan -- to the day. Aurora Dawn lives in Alaska so they are always happy to see Lachlan. As usual, they gave him a banana, which he gladly took. I hope Lachlan will remember these visits, a happy connection to our island's heritage. I really hate to break this news to all of you off-islanders....but the weather here has been just stellar! I know, we've heard about cold weather around the country -- even snow in parts of the midwest and New York. Yesterday afternoon I went for a stroll along the beach. Wore my bathing suit. Sky was bright blue, temp in the upper 70s, sand warm and soft. And the water was....how shall I put it?....inviting. Never passed another person the whole time I was out there, so I did what any sensible person would do, and then I jumped in. It was wonderful!! "Your latest post, about renowned visitors, made me wonder if any other big-name folks ever find their way to the island -- and what sort of reception/treatment they might receive from other visitors/residents...."
Some of you may have read that Charles Lindbergh landed on the north end of Ocracoke many years ago. He stayed several hours and visited with the men of the Life Saving Station. I once found an obscure reference to the author John Dos Passos. Apparently he and some friends hiked along the Outer Banks in the 1920s. They crossed Ocracoke Inlet courtesy of the US Coast Guard, and stayed overnight at Captain Bill Gaskill's Pamlico Inn. According to "John Dos Passos: A Twentieth-Century Odyssey," by Townsend Ludington, "The evening they left Ocracoke they had a lively time square dancing with several pretty girls and drinking Captain Gaskill's concoction of Grape-Ola mixed with orange extract." I commented to one islander that I wondered if Captain Bill or any of the others realized that a rather well known author was visiting them. His reply, "Probably not, and even if they did know they wouldn't have cared." In the '30s & '40s many North Carolina politicians (Governors, Senators, & Representatives) came to the island to hunt and fish. They relaxed and spent many a happy hour with their island hosts. In more recent years I've heard that a number of celebrities have visited Ocracoke. I do not vouch for any of this information! You never know what to believe around here, but the following names have been tossed about: Jimmy Buffet, Robert Plant, Tom Cruise, Nichole Kidman, Michelle Pfeiffer, Johnny Depp, Kevin Costner, and Sean Connery. I've not seen any of them....but then I probably wouldn't recognize most of these folks anyway (they don't let me out much!). When rumor spreads that a celebrity has been spotted on the island, there is a brief buzz around town, but then it dies down pretty quickly. Like old Bill Gaskill I suspect that most islanders would just yawn. We get a lot of interesting folks passing through Ocracoke. One long-time customer went to high school with Fidel Castro. Two young women visited several years ago from the island of Mauritius. (If you have to look on a globe to know exactly where this is you're not alone.) Some years ago an older gentleman sat on the front porch and entertained us with songs he played on the saw. The former Governor of NC, Jim Hunt, stopped by two years ago. We have a smattering of odd folks too, now and then -- the spider lady, the blanket man, the car lady (don't even ask about these folks). And then there was the young man who lived here for a few years who could play the William Tell Overture on his teeth. Several days ago a gentleman walked into the gallery wearing a wooden hat. That's right, a wooden hat. He carved it from a block of laminated wood. It was nicked in a couple of places. We asked him how that happened. "I was on this horse," he said, "and it bucked. I went over the horse's head and got my boots caught in the stirrups. I yelled. That's when the store manager came out and pulled the plug." Anyway, here's a photo of Henry Barkley from New Castle, PA. Hats off to Henry! You can read our latest newsletter here. It's the story of the Community Store and other general stores on the island..
Last month my good friend, Jim Fineman, from Manteo paid me a visit for several days. He took a number of photos which he shared with me. I thought our readers would enjoy seeing a few of them. The first two are of my outbuilding. The third one is of my front porch. The last, of course, is a view of Silver Lake. Dale recently reminded me of another unique island expression that he "just came out with" sometime last week. Talking with his wife, Jaren, he mentioned someone "going on a wydge." Jaren is not originally from Ocracoke and she was completely dumbfounded. She'd never heard of a wydge. I'm guessing you haven't either, unless you're an old-time O'cocker. Dale had no idea where the word came from, but he, of course, knew that it meant going on a trip. So, just like I've done so many times, he strolled over to cousin Blanche's and ran it by her. Lo and behold, she had the explanation that made perfect sense, if we'd just thought about it. Years ago it was not uncommon for Outer Bankers to transpose Ws and Vs. For example, they'd say they were going into the willage to buy some potatoes. Or they might be taking some witamins for their health. It's not hard to see how they also might be undertaking a woyage. With a little bit of Ocracoke dialect thrown in, woyage, it would seem, almost effortlessly became wydge. Just thought some of our readers would enjoy seeing a photo of me and my companions at the top of Mt. LeConte last week. I'm second from the right in the front. We islanders so often get the question, "What do you all do in the winter?" Most of us enjoy traveling, along with a bit of adventure, when we're not at home. Yesterday I mentioned driving to Avon on Hatteras Island to see a doctor. It was a five hour round trip for a ten minute appointment. I went to Avon because we have no health care provider on the island right now. A reader asked, "No health care provider on the island until next week? Would you elaborate on that? I've seen the health care facility just up the road from the library. Is that not staffed year round? Just curious about how O'cockers cope with the health care related slings and arrows of daily life." Yes, we do have a health clinic, but for a while now we have had no resident physician. We do have a very fine physician's assistant who is here often (I don't know his exact schedule), but, unfortunately for me, he won't be back on the island until next week. As you might imagine, it is not easy to attract a physician to such a small isolated village. For one thing, we do not have the funds to compete with most other places. Also, although things slow down in the off-season, the summer months can be very stressful for a single health care provider. He or she is "on call" twenty-four hours a day. It is difficult to go fishing, take a boat ride to Portsmouth, drive "up the beach" for groceries, or even to take a couple of hours to lie in the sun on the beach. Of course, there are other advantages to serving on Ocracoke, but apparently not enough to keep a full time physician here right now. Hi! This is Philip back again. I was off-island, as we say, hiking in the Great Smokey Mountains, and then joining thousands of other folks at the National Storytelling Festival in the tiny village of Jonesboro Tennessee. Every fall I hike to Mt. LeConte in East Tennessee. It was an eight mile hike to over 6500 feet. As you might imagine, the views were fantastic. At sunset we sat on a rocky outcropping watching the sky turn shades of red, orange, and pink...and then deep violets. Finally there was that inky blackness and hundreds of distant, sparkling, fiery diamonds strewn across the heavens. Much like Ocracoke's sky, but enchanting because of the altitude & the rolling mountains as far as the eye could see. 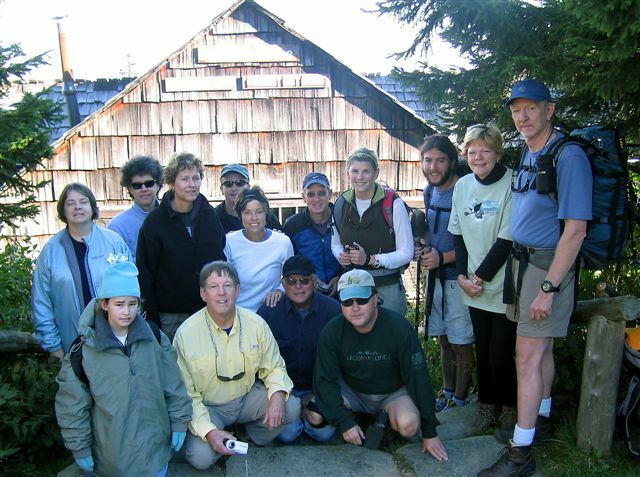 One endearing fact about LeConte is that there is a "lodge" on the top of the mountain. There are no roads leading up there, but years ago they built this lodge (don't ask me how they did it). Every spring they helicopter great quantities of food and supplies in. Then throughout the season (the lodge is closed in the winter -- too much snow) they use llamas to transport linens and trash up and down the trails. Anyway the benefit to me and my companions is that they feed us and give us lodging when we get to the top. So our packs are lighter, and we eat better than the typical hiker! Unfortunately, I returned home with a severe case of bronchitis which has kept me at home for days. Finally I drove to Avon yesterday to see a doctor (we have no health care provider on the island until next week). Now, with antibiotics I should be improving steadily. So I expect to be back, posting journal entries on a regular basis. I thank Jude for keeping up with island news while I've been away or out of commission. I hope she'll continue to post some more. I like her style. I thought Philip would be back with you today but he's a bit under the weather. Which brings me to this mornings' shower. This morning was one of those kind of mornings that you want to go on all day long - sparkling - slow - the air scented with the good smells of the earth and the water. I stayed 'til I was pruney. Our outdoor shower is on our deck by the kitchen door. When you're in our shower and look up there's the sky and cedar trees and the wisteria vine. When the wisteria is in bloom you're showered not only with water but with hundreds of small lavender petals. I have bowed slightly at the waist a time or two imaging myself as royalty. One is quickly jolted back to reality when upon turning to grab the soap (Franks') you find yourself eye to eye with a frog or fiddler crab. Then there are the cats . Lord , they let you have no dignity as they gaze up at you from the outside. It's not a place for modesty - an outdoor shower. Good thing those critters can't talk. Guess I must have confused some folks and I do apologize. Philip has been gone a lot lately so I've been doing the blogs ( I prefer visits ). I know you can tell the difference between us because when I do them they're erratic in number, the pot lucks stop as do the daily walks on the beach. I apologize for that too. I'm Jude and I've been here forever, but I'm in the back. If you look at the photo on the home page, I'm the blond in the sun glasses and turquoise dress. My son Travis is next to me. Only problem there is that photo is about a million years old and I no more look like that anymore than Bill Clinton does. My offical title around here is "Thorn in Philips' Side" and I carry it proudly. My husband Frank and I have the Hemp Shop next door to Village Craftsmen (little plug there). I'm sure many of you have stopped by there and been insulted by Frank. He's very good at it in a real cute way. Dale Mutro is married to my niece Jaren. My son Matt and daughter-in-law Mary live here with their two daughters Lici, eight and Hannah Rae, two and a half. Mary works for Ocracoke Preservation Society and Matty is a commercial fisherman and is an excellent carpenter. My youngest son Travis lives in Indianapolis with his wife April and their three year old daughter Ava. We have a wonderful Pembroke Welch Corgi named Willy and I know a lot of you know him! He's a celebrity. I'm very involved with Ocracats and have been for years. I kid Philip a lot but it's with affection. He's a good and kind friend. He's back on the island so you'll be hearing from him 'til he goes again. It's been enjoyable visiting with ya'll. Later. The weather is just too beautiful for words today and I don't want to be here working at all. I have " Fall Fever " and so does Dale. We've got the wanderlust for some strange reason. Frank and I just got back from out near Murphy. Dale and Jaren just got back from a trip to Maryland. Philips' been gone awhile and Dallie is headed to see her Grandbabies. We work to groanin' in the summer and this is our first letting down. My heart was in Scotland yesterday, in the Highlands. The wildness of the Highlands is so similar to Ocracoke, not the look but the feel of it. I've got to draw myself together to finish out the season. Oh Lord, I'm eight again and twitching in my seat. It's nice to know some things don't change. I am not a fisherman or fisherwoman for that matter but I love boats and water and beaches and water and consequently I frequent fishing "places". My husband and some of his friends, our youngest son Travis and Dale are enthusiastic fishermen. Our oldest son Matt is a commercial fisherman for heavens sake! It is a monetarily precarious vocation as I am often reminded by my daughter-in-law and a disappointing avocation much of the time as I can attest to by the male grumblings of my husband. But this week...... this week..... the Fish Gods have smiled on Ocracoke! Customers in the shop are telling tales of incredible surf fishing. Frank and Al went out in Als' boat yesterday morning and caught their quota of speckled trout in less than three hours along with a mess of other fish. You couldn't beat the smile off of Franks face with a stick ( at least I couldn't.... and I tried). Charlie O'Neal from O'Neals Dockside, between puffs, exclaimed that it was like the "old days". Matt and Hardy fished for twelve long hard hours. It was a good day. They all slept well last night. A couple of weeks ago I promised we'd come back with a few more recollections about the hurricane of '44 otherwise known as 'The Great Atlantic Storm". Not first hand recollections mind you, tho' some days I do feel about a hundred and five I assure you I don't come close. These actually are Dales' recollections of what his Granny remembered having lived through it. The evening of Sept. 13th, 1944, Aycock Brown put up postings around the island of the impending storm but for reasons not to be discussed here, he was pretty much ignored. That night was beautiful, Ollie recalled, with hardly a breeze blowing. Before daylight the next morning winds were gusting over 100 MPH. Estimated winds at the height of the storm were 130 MPH. The tide came up over most of the island flooding all but a few homes. Boats were washed up all over. Dales' Grandma Ollie said that her Dad rowed his boat up to the front of their house and loaded up all of the family and carried them over to her grandmas house which was , they thought, safer. The women went upstairs with the children. The men stayed out on the front porch where they kept floating boats from slamming into the house and damaging it. They could feel the house move as the tide rose. It must have been frightening. When the tide finally fell, they opened the doors and the water went rushing out like "Niagara Falls ". By mid-day it was over with no lives lost. On top of all of the debris out in the road sat their outhouse! We thank Dale for sharing his Grannys' recollections. Ollie Mutro passed from this life October 28,2004. Did I Ever Start Something! Well, back from vacation and it seems like we left just yesterday. Back to find out that I really started something in the village with my blog ( I do dislike that word ) about Grant our woo-hoo UPS man. Seems as if everyone is woo-hooing at him as he drives his truck through the village delivering packages to the various places of business. I was out to the counter this afternoon when Grant came in the back door and let out a big woo-hoo himself. I just looked at him. He started laughing. I don't have anything for you, he said, just came in to give you a big woo-hoo! He sure is enjoying his new noteriety. "Brown" in the body of Grant McDonald has done a lot for Ocracoke. A nicer, kinder more cheerful person you could not meet. I have never and I mean never heard him speak an unkind word. I wish I could say as much for myself. Two years ago when Frank and I went to Scotland, on a day pouring down rain, I picked some heather and a pebble from the stream that ran red with the blood of the McDonalds. That was in Glencoe where the Campbells slaughtered that proud clan. I brought the heather and pebble back and gave them to Grant. He accepted them and held them with such reverence. Our tall, red headed,freckled McDonald dressed in brown shorts.......woo-hoo.